I often tell my athletes that basic shapes that we work on translate to skills that they might want to attain. I use the lunge as an example for handstands, cartwheels, round offs, etc. Another one is hollow hold...for use on bars for swinging skills, vault, and, of course, floor. Today, I am going to discuss rolling and how it relates to flipping. By the way, the term somersault can be misleading as all rolls and flips are somersaults. an acrobatic movement in which a person turns head over heels in the air or on the ground and lands or finishes on their feet. 1. First is tucking the chin, pulling down the chin towards your chest. 2. Next would be to protect you head/neck even further by putting hands up above the ears with firm but bent elbows that way not all of the weight of the body is just on the head. 3. Then squatting to create a crouch before letting the body rock forward to the rolling action. Once the rolling action has started, the athlete must keep in the egg shape (long ways not sideways silly) so that the back is rounded to the hips which helps on the final part of the roll which is landing on the feet. 4. The athlete needs to keep the feet tucked under the hips, I call it “heels to hips”. Good forward rolls land on the feet without the hands/arms leaving the head. Some people teach a “reach for the shins” once the athlete is on the back which can certainly help in the standing up portion of the skill. Wow---who knew a forward roll explanation could be a so long?!? Being able to squat super low is very helpful as well as standing up from that low squat. There are some athletes that do not have the ankle flexibility, knee flexibility, or the hip flexibility to squat comfortably, let alone balance. Pushing off the feet with legs together. Good forward rolls vs great forward rolls, good equals just getting over the head, great equals keeping the feet together. Now this type of jumping doesn’t involve the whole body leaving the ground, just the hips to the heels portion. The inertia from pushing the hips over the head should be enough to carry them through the next two phases. Knees tucked towards the head so you can rock on your back from shoulders to hips. Heels should be tucked to the hips as much as possible while keeping the knees to the chest. This is critical to good rolls. Some athletes like to pull the feet away from the body which might create a flat surface of the back to fall on or they will arch their back and again create either too flat of a surface to roll on or worse keep them from going over altogether. Stomach strength is critical for this. Being able to stay in a tucked shape long enough to roll up to the feet un-assisted and stand, a reversal of the squat if you will. A drill I use to help with this is candlestick roll ups. I would change position one of the model below to having her arms up by her head and flat on the ground. 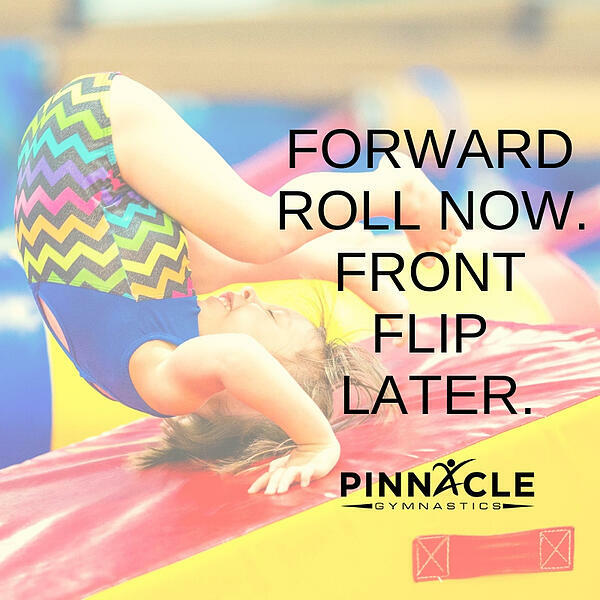 How Does a Forward Roll Create a Front Flip? Now how does this relate to a front flip? We use a lot of the same shapes in a Punch Front/Front Flip. There are differences, but for the most part it is very similar. Keeping the chin in a tucked position, reaching for the shins to create an egg shape in the spine, and “rolling” all the way the feet are all part of a successful front flip. We typically start our inexperienced athletes with rolling down a wedge mat or incline mat (although they would technically be declining from the top to the bottom) to help with easing them into rolling as well as providing additional padding for their spine. Once they show proficiency in rolling down hill, we can move them onto a flatter surface. 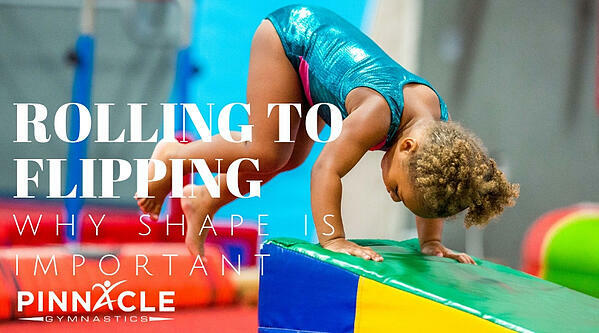 You will also see young children rolling over a preschool bar in our classes which also helps to condition them to tuck the chin, hold an egg shape, and land on the feet. The hands obviously need to hold on to the bar but I digress. “Around the World”, as we call it, is a great skill for future front flips. Next we would introduce bouncing/jumping into forward rolls. That might mean jumping off a higher surface to the flat floor and then rolling or jumping up to a higher surface and rolling down/across. One of my favorite drills is to jump off a trapezoid block to the floor and bounce forward into a roll down a wedge mat. Moving on to a more advanced drill would be to run, hurdle, and bounce up to a waist high resi pit mat and try to get all the way to the feet. Naturally when they can bounce this high, we can take the drill higher up to chest height. Last would be to hand on spot an athlete through a front flip. Depending on the equipment you have, using the "Tumbling Track" or a mini tramp is helpful. I am not really going to go through the steps to spot a front flip here...mainly for safety reasons...but if you really want to know...Come work for us!